Finding a new job can be a long and difficult process, and it can sometimes feel like you don’t have much time for anything else. Fortunately, you can now do your job search on the go. We’ve highlighted seven super helpful mobile apps that you can use to network, apply to jobs, and even prepare for an interview. 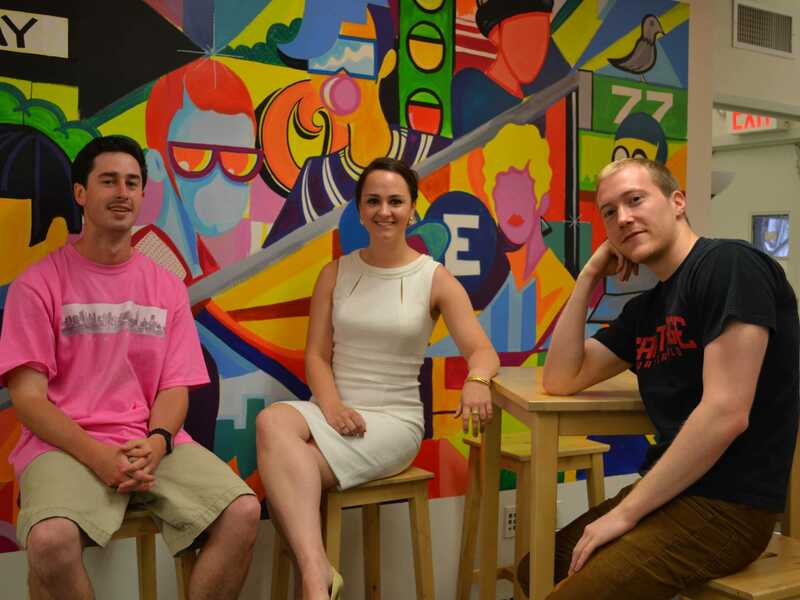 What it is: Tinder for networking. You select your interests from a wide range of choices (anything from 'HTML/CSS' to 'skating') and then get shown a series of potential matches who are looking to meet like-minded people. When both parties opt in to communicating, you can set up a meeting for coffee or a drink. Why you need it: It's important to be submitting résumés and applying for jobs, but oftentimes networking can be more fruitful. Even if the people you meet can't get you a job right away, they might be able to put you in touch with someone who can, or serve as a reference later on. 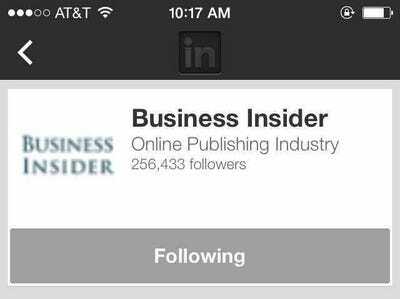 You can follow Business Insider on LinkedIn. 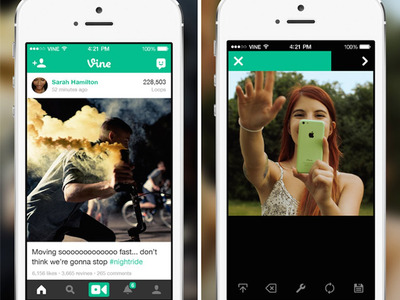 What it is: The world's largest professional social network, with more than 300 million users. These days, your LinkedIn profile is basically your online résumé, and almost anyone who will consider you for a job will look you up on the site in the process. Why you need it: Use the LinkedIn mobile app to update your profile on the go, reach out to influential people in your field, and see if any of your favourite companies are hiring. And if you have a job interview coming up, it never hurts to look up the person you're meeting with to get a sense of their background. A job posting on the Indeed app. 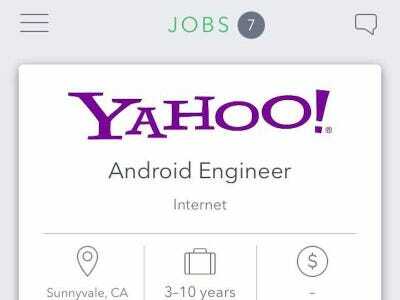 What it is: A mobile app put out by Indeed.com, a website that aggregates job postings from thousands of websites across the internet, posting upwards of 30 million new job opportunities each day. The app allows people to filter listings by keyword, company, job title, and location. You can also post your résumé for recruiters to see. Why you need it: They say looking for a job can be a full-time job in itself, and Indeed's mobile app will help you keep an eye out for the right gig, regardless of whether you're near a computer. 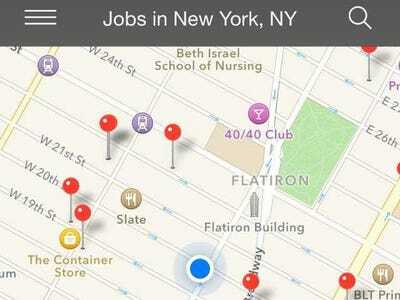 Snagajob will show you where you can find hourly work nearby. What it is: A massive job board for people who want to be paid by the hour, whether it's in a part-time or full-time job. These jobs include retail employee, delivery driver, dishwasher, and hair-stylist, among others. The job applications are loaded into the app, and you can apply to some positions with just one finger tap. Why you need it: If you're looking to have a job rather than a career, Snagajob is a great resource. Use it to make ends meet while you're pursuing your music career, brainstorming your next startup, or struggling financially. Yahoo is one of the companies looking for talent on Switch. 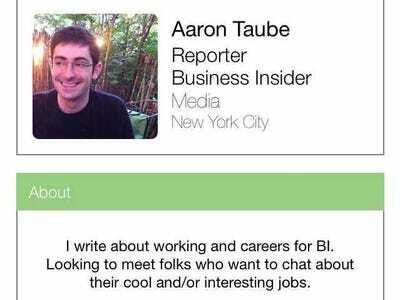 What it is: Tinder for jobs in the New York media and technology industries. You see jobs from top firms like Facebook, Yahoo, and Spotify, and you can swipe left if you're interested in applying or right if you're not. Why you need it: Switch is a fast and fun way to browse New York-based jobs. If you're looking to cast your net a little wider, you might want to try Jobr, which functions similarly but has jobs (mostly in tech) across the country. 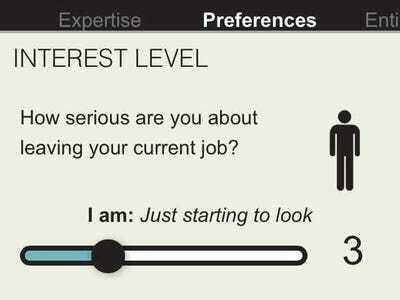 Poacht lets users set the parameters for what jobs they're interested in. What it is: A job search app for people who aren't ready to conduct a full-on job search. Poacht allows people to upload an anonymous profile with their skills, résumé, and what they're looking for in a new job as far as salary and growth opportunities. 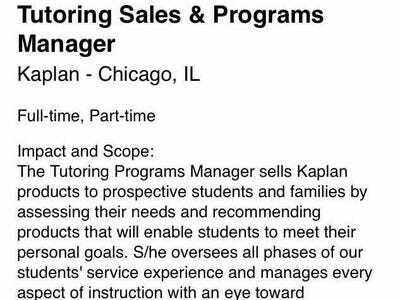 Then, the hiring managers come to them. Why you need it: Poacht works best for highly skilled people in the tech and business fields that recruiters are desperate to hire. The idea is that if you are relatively happy with the job you have, you can search for an even better situation passively, and without tipping off your employer. Monster Interview app gets you ready for the big moment. What it is: An app, put out by the jobs site Monster.com, that is specifically geared toward preparing you for a job interview. It gives a step-by-step rundown of everything you should do before, during, and after your interview. Why you need it: The app contains lots of useful tips and features. For instance, it has a list of sample questions along with advice on how best to go about answering them. The app also lets you film yourself answering the questions so you know how you will look and sound on the big day.